Siam beach resort located in the long white sandy beach on the south west of Koh Chang the second largest island of Thailand, Koh Chang is 350 km away from Bangkok near the border to Cambodia in the Gulf of Thailand. Siam Beach Resort offers you the best choice for traveling with our private comfortable minibus from Bkk or Suvarnabhumi Airport directly to our hotel. The cost of one way trip is THB 5500 including ferry tickets(4 pax). The traveling time from Bkk or Suvarnabhumi Airport to Siam Beach Resort is only about 6 hours which is much less than traveling by bus or other services. Our minibus can seat 6-10 people and equipped with comfortable seats, radio, CD player and A/C for your relax and safe trip. the bus is available many times daily from 6.00 am – 11.00 pm with approximately cost THB 250 per passenger and with approximately travel time at 6 hours. You can take local shared taxis “Song Taew” to Ferry pier at Ao Thammachat pier or Center Point pier, it takes about 40 minutes and costs 60 Baht per passenger. - Center Point pier to Koh Chang (Dan Kao pier/Koh Chang Center Point pier),It takes 45-60 minutes and ferry ticket costs 160 Bt./person(round trip), free for vehicles. Ferry time is available every hour everyday between 6 am – 7 pm. - Ao Thammachat pier to Koh Chang (Ao Sapparod pier), it takes 30 minutes and ferry ticket costs 120 Bt./person(round trip), a vehicle charge 200 Bt/round trip. Ferry time is available every ? hour everyday between 6am – 7 pm. From Ao Sapparod pier or Koh Chang Center Point pier to Siam Beach Resort, there will be local shared taxis which are called “Song Taew” to transport you to our hotel at THB 80-100 Bt per person. 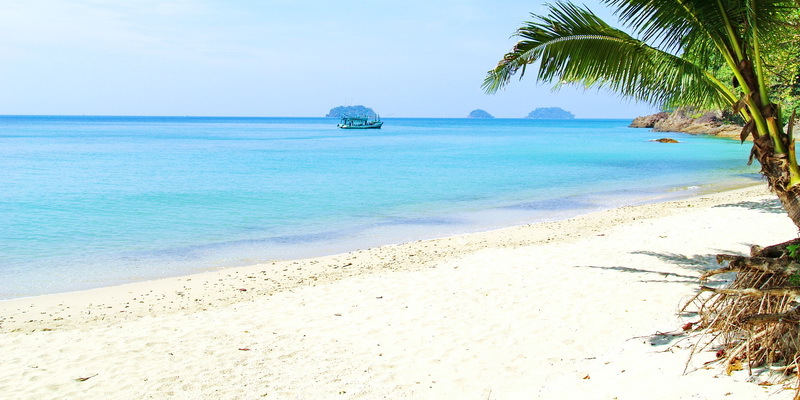 The taxi to Siam Beach Resort will take about 1 hour and available from 8 am – 8 pm approximately. The bus is available 1-2 times daily which costs THB 350-400 per passenger including ferry tickets. It takes about 6 hours to the ferry piers and you can choose you want to get off at Ao Thammachat pier or Center Point pier. You can continue you transport to Siam Beach Resort as mentioned above. Please note that we also can provide you a private transport service from the pier to our hotel if you prefer. Alternatively, if you stay at “Khao Sarn” road area in Bangkok, you might prefer to take minibus and full sized bus service from “Khao Sarn” road directly to Ferry pier. You can book your seat at travel agents in “Khao Sarn” road area. For big bus, It costs about 350-400 Bt/person and may be include ferry tickets. The distance from Bangkok to Koh Chang is about 350 km. From Bangkok take BANGKOK to CHONBURI MOTORWAY which starts from Rama IX Road and onto Srinakarin Road exit after paying the second toll that leads to Ban Bung, then forward to KLAENG district > CHANTABURI province > Klung district intersection > about 40 k.m.will reach LaemNgob intersection > turn right to Ferry piers at the opposite of PTT gas station > Along the way about 20 k.m.on your right, there will be ferry piers where your car can be loaded across to Koh Chang. A round trip ferry tickets cost 200 Bt. per car and 100 Bt. per motorbike, passengers and driver need to pay 120 Bt./person. A round trip ferry tickets cost 160 Bt. per person and free of charge for vehicles. 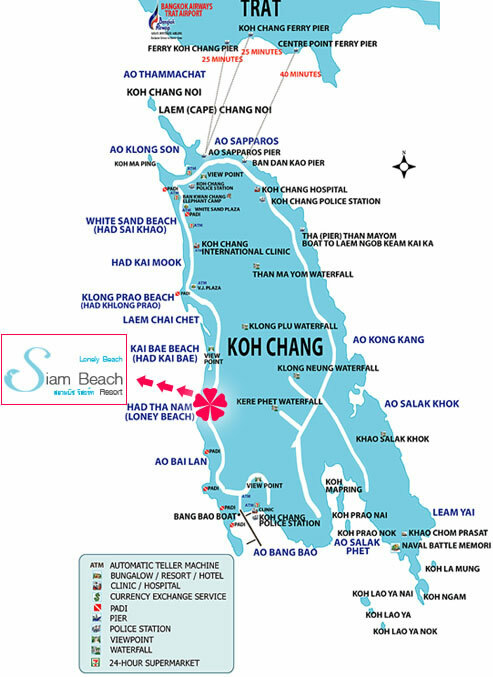 Turn right and drive about 23 km to Siam Beach Resort on your right. The road in Koh Chang is not in normal condition as there are many steep slopes and S curves, for your safety; please check your car to work perfectly before coming to Koh Chang.